This is the second Sunday of Lent. 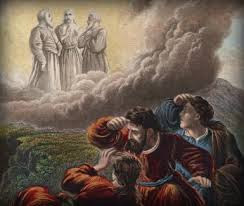 Our readings today focus on the fulfillment of God's promise to Abraham and the prophets as Jesus is seen in his glorious transfiguration, conversing with Abraham and the prophet Elijah. In our first reading, (Genesis 12:1-4), we hear of God's promise to Abram (later called Abraham) and his call to go to the land of Canaan, a land far away from his home in Mesopotamia. Abram placed complete trust in God and dutifully answered the call; and thus began the journey of the chosen people of God. The LORD said to Abram: Go forth from the land of your kinsfolk and from your father's house to a land that I will show you. "I will make of you a great nation, and I will bless you; I will make your name great, so that you will be a blessing. I will bless those who bless you and curse those who curse you. All the communities of the earth shall find blessing in you." Abram went as the LORD directed him. In our Gospel reading (Matthew 17:1-9), we hear the account of Jesus' transfiguration before Peter, James and John. It is this place where Abraham's journey of so long ago ultimately lead him, conversing with the prophet Elijah and with Jesus. In our Epistle reading (2 Timothy 1:8-10), St. Paul reminds his listeners of the wonderful grace and blessing bestowed upon us in Christ and our rightful response to that grace. Beloved: Bear your share of hardship for the gospel with the strength that comes from God. He saved us and called us to a holy life, not according to our works but according to his own design and the grace bestowed on us in Christ Jesus before time began, but now made manifest through the appearance of our savior Christ Jesus, who destroyed death and brought life and immortality to light through the gospel. We are called to imitate our father Abraham in placing complete trust in God, whatever he calls us to do and wherever he leads us. For ultimately, we know it will lead us to the transfigured Christ.